It has been 6 months since my last Holyhead bash and a lifetime since the 37's disappeared so enough is enough as they say and I decided to ride the coastline again, even if it did mean an HST. 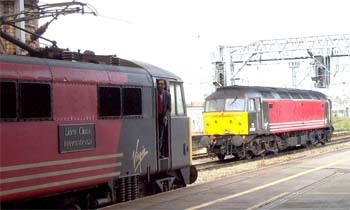 The sight of my first "Voyager" at Crewe served as a reminder that the HST's won't be around forever and certainly the 47 haulage will soon be a memory. 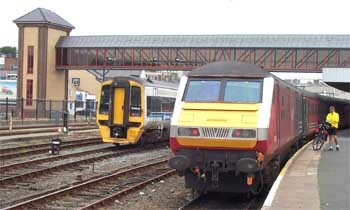 To run behind a 47 in midweek means an overnight stay in Holyhead and a night run from Crewe both of which are no good to me so an HST it had to be. 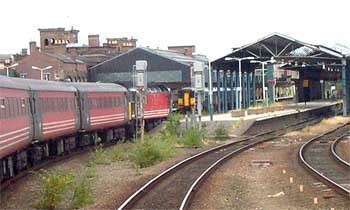 So, on the last minute and on a Friday too, I arrived at Crewe for the 08.35 from London Euston running as 1D87 (Thank's to Charlie Hulme's North Wales Coast website for the timetable information) and booked to leave Crewe at 10.45. 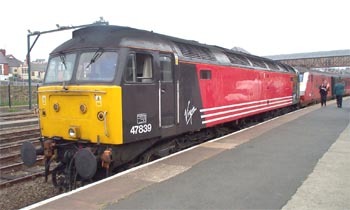 A quick look round revealed a smart looking 47839 ticking over in bay platform 8 but very little else, 37420 "The Scottish Hosteller" was still looking forlorn on the scrap line, how could they possibly cut that loco up? The 47 revved up and headed off South only to return some minutes later and pass through the platform 12 loop and stop at the North end signal gantry. 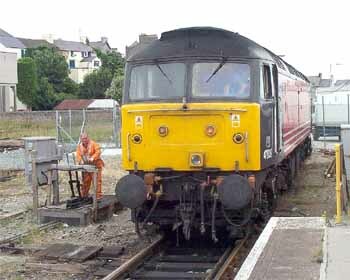 I headed over to platform 11 to await the train and was interested to see a shunter walk along the platform with a colleague when it hit me why 47839 was waiting at the gantry - it was a loco swap and we were to be loco hauled to Holyhead - a runround! The following pictures record some of the day's events. The train arrived some 15 minutes down and whether this was something to do with the loco haulage I know not. 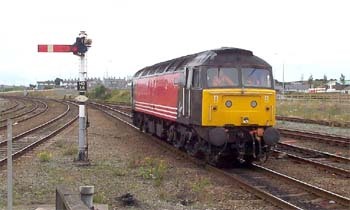 The locomotive, 86229 "Lions Clubs International" was soon unhooked and sent off to park on the West Coast Main Line alongside the Crewe Heritage Centre. 47839 then pulled forward onto the Chester line where the driver swapped ends and returned to the station to hook up to the train. We were soon away and rattling through the maturing Cheshire countryside for the county town of Chester (the correct title is actually the County of Chester). I have to say that the ride and noise level experienced in the Mk 3 stock is infinitely better than the 37 hauled RR stock although the flange noise is still considerable on this stretch. Arrival at Chester after a switch over to the up line just outside the station in order to gain the up platform because a 153/150 separation process was being undertaken on the down side. Late running must cause many problems. Heading West out of Chester. 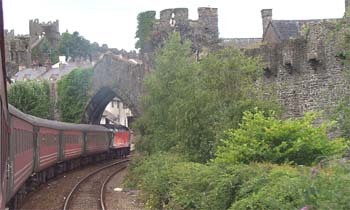 Several stops along the coast and then out from Llandudno Junction onto the cob and Conwy with its imposing castle and tubular bridge. 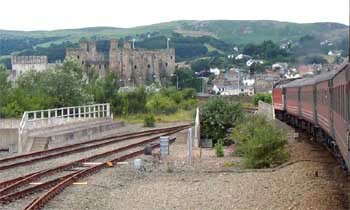 The tubular bridge blends well into the castle itself, a masterpiece of early engineering. 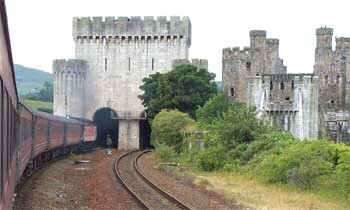 The line skirts the castle and enters Conwy station through an ornate matching archway scene of many good shots. 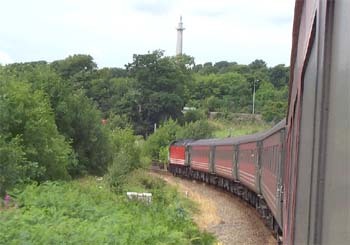 Leaving the Menai Bridge and onto Ynys Mon with the Marquess of Anglesey's Column on the hillside, the track is single at this crossing point. yes, I know, it's all been done before, but not by me with a 47 it hasn't. 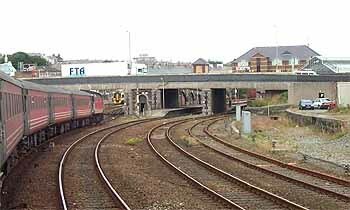 A sharp dash over the Island and into Holyhead Station. 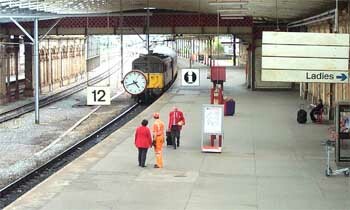 A brief pause, during which the driver took a few shots of his own, and the locomotive moved forward onto the head shunt to prepare for the runround. This must be an ever diminishing procedure on the British railway network as units progressively take over. 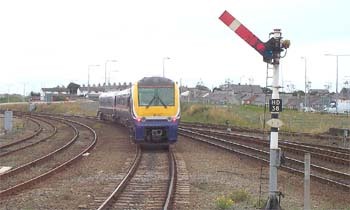 Here the shunter has received permission to change the points over as the interlock is released. The engine only just fits the head shunt. Running round past the train. 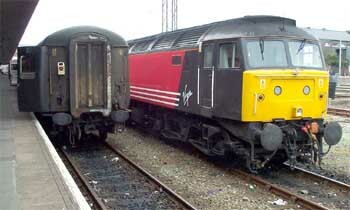 At the other end DVT number 821010, named "101 Squadron", waits to receive the 47 as 158832 stands in the background. 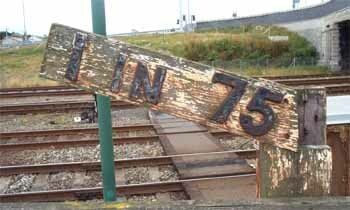 At the eastern end of the station an aging gradient post indicates a climb of 1 in 75 which poses little problem for modern traction but has seen steam struggle on occasions particularly in the rain. 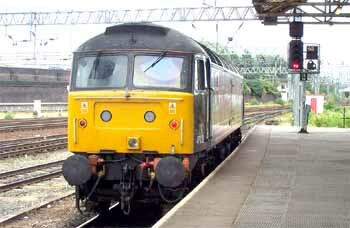 While the Class 47 had disappeared 175104 left en route for Manchester shortly followed by 175111 for Stockport. ......and hooked on to the DVT in readiness for the journey back East. Arrival at Crewe and Driver Griffiths, the first lady driver to operate Virgin trains on the coast run, checks out the locomotive while detachment takes place. I was informed that this lady's Father and Grandfather were both drivers on the railways. 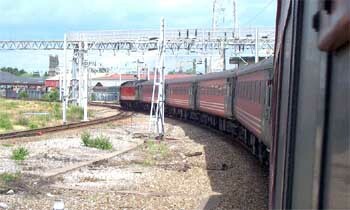 The locomotive ran forward to the signal before heading off to reverse and power back North through the station. 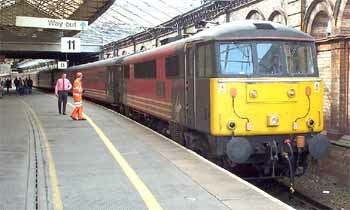 Meanwhile, at the other end, 86229 was reattached to the train to propel it South to London. 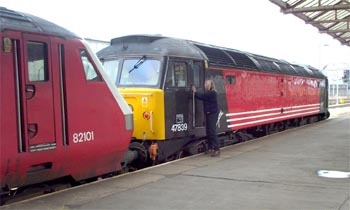 Unfortunately there were problems with the connections and the DVT could not communicate with the locomotive. 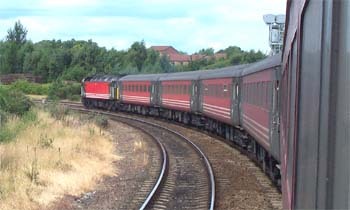 The staff had just agreed to run the engine round to the front when the problem was cured and the train left some 50 minutes down.